‘Three Little Pups’ starts as a pastiche of the Disney classic ‘Three Little Pigs‘ (1933) with dogs instead of pigs, and the wolf being a dogcatcher. However it changes into a typical Avery-cartoon as soon as the wolf has failed to blow the smart little pup’s dog house down. He then goes completely berserk on trying to break the house down only to freeze and say into the camera in a remarkably laid-back Southern voice, provided by Daws Butler: “Well, that’s a well-built dog house, man”. This is clearly a completely different wolf than we had seen before in Tex Avery’s cartoons. Instead of having wild takes, his reactions to his humiliations are absurdly stolid. All through the picture, he remains completely calm, and several times we can hear him whistling the civil war tune ‘Kingdom Coming’, accompanied by the barest minimum of percussion. This would become his signature song in his reappearances in the Tex Avery one-shot ‘Billy Boy’ (1954), and in two of Michael Lah’s Droopy cartoons: ‘Sheep Wrecked’ (1958) and ‘Blackboard Jumble’ (1957), which reuses some animation from ‘Three Little Pups’. 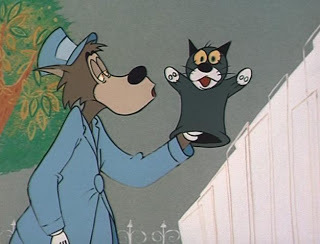 Incidentally, the wolf is not the first animated character to whistle this tune. Twenty years earlier, Pooch the Pup already whistled it in the Walter Lantz cartoon ‘King Klunk‘ (1933). Avery worked at Lantz at the time – is it possible he remembered the tune from this cartoon? Note the anti-television gags in this short. Tex Avery would make more of those in ‘Drag-along Droopy’ (1954). During the 1950s television made things difficult indeed for theatrical cartoons. Less and less visits were paid to the cinemas, and so studios were forced to cut down their costs. This process ultimately led to the demise of the theatrical cartoon, and to the decline of American studio animation in general, which reached an all-time low in the 1970s, only to be revived again at the end of the 1980s.